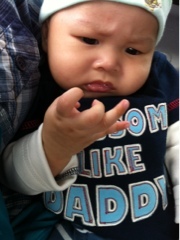 Mon, 13th Feb. Baby Iqbal went to the clinic for his two months old Doctor's appointment. We did the usual once we arrived at the clinic, checked his weight - 6.04kgs and height 60.5cm (while the nurse measured his head circumference 21cm). Those are his numbers one week before Baby is three months old. When the Doctor checked him, everything is good. Alhamdulillah.. They told me to continue breastfeeding him. Insya Allah for as long as I can, I will. Tue, 14th Feb. Husband left for Kuching. This time he will be away for 4 days and 3 nights. Baby Iqbal and I (along with my dad, sister and brother) sent Husband to the airport. It was Baby Iqbal first trip to the airport. Well, other than Birau, he has not been anywhere else actually. Hehe kesian..
Alhamdulillah, Baby Iqbal and I survived our first night together. Usually his dad will put him to sleep at night. Without Daddy around, I tried my very best last night and luckily Baby Iqbal inda mengusut. He was fast asleep last night after few short surah I read to him. We have two more nights to go. Let's be strong, Ef!